One of the first ways a prospect will measure you to be trustworthy is by doing what you say when you say you’ll do it. This may sound simple but it is absolutely true. If you tell a prospect, I will call you back this Thursday at 2:00pm, you better call back at 2:00pm. Not 10am nor 4pm, but 2pm. I don’t care if you have to set an alarm on your smart phone, you have to do it. Punctuality is one of the first things measured by your prospect. Whether it is a date or a time. Are you a person of your word? Is your word your bond? When I call that prospect back at 2:00pm Thursday even if they don’t answer, my voicemail will be “I told you I would call you at 2:00pm Thursday…” This has a huge impact on everything else you tell them. If you tell them, I’ll email you my contact information or I’ll mail you information and you don’t, you are done with that prospect. It is really hard to recover. Treat your prospects the same way you want to be treated in a sales environment. Being punctual to the appointment has the same effect. If the appointment is at 9:00am Tuesday and you show up at 8:55am, your chances are very good they will trust you in your presentation. If you causally stroll in at 9:20am with a lame excuse or say nothing at all about being late, you just told the prospect,” I’ll probably lie about a couple of more things as well.” Where is the trust? 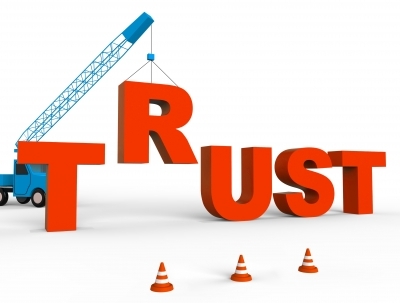 Why should the prospect trust you? You no longer seem to be trustworthy. Remember that people make up their minds about you in 20 or 30 seconds. We as a society are both curious and judgmental. If you don’t believe it, drive by an auto accident on the other side of the freeway, is your side slowing down? Sure, people want to see what is going on. Judgmental, are you kidding me? Watch two women make horrible comments about another woman’s dress until she walks up and they both tell her how pretty she looks in that dress. Whether it is said aloud or just a thought, you will be judged. The prospect will measure everything you say against what they know to be true. The first factor they have to measure your integrity is punctuality and follow up, so don’t blow it! « Did Pabst Win the Blue Ribbon?